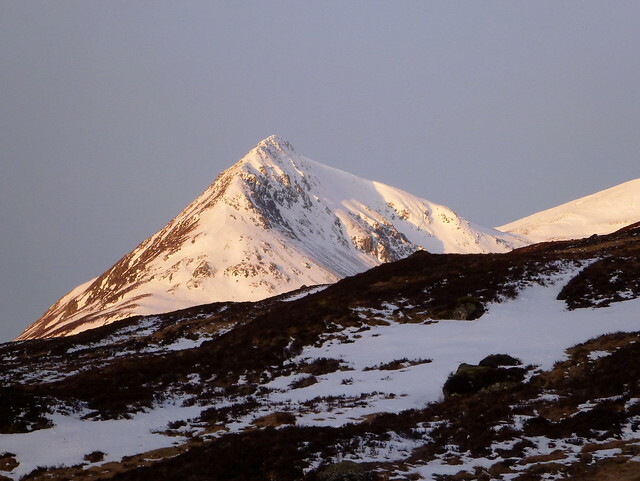 Ever since I'd spotted the Lancet's Edge in a coating of ica and snow on our Ossian Adventures three Easters ago, I knew I wanted to climb it. 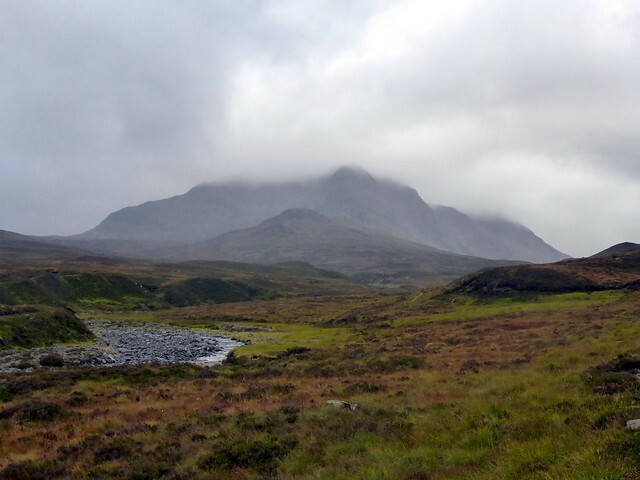 Sgor Iutharn and Meall Glas Choire were the two southern remaining Tops I have left to do, and with Allison and Craig away off to Torridon for a week's break it seemed an opportune moment to get the deed done. 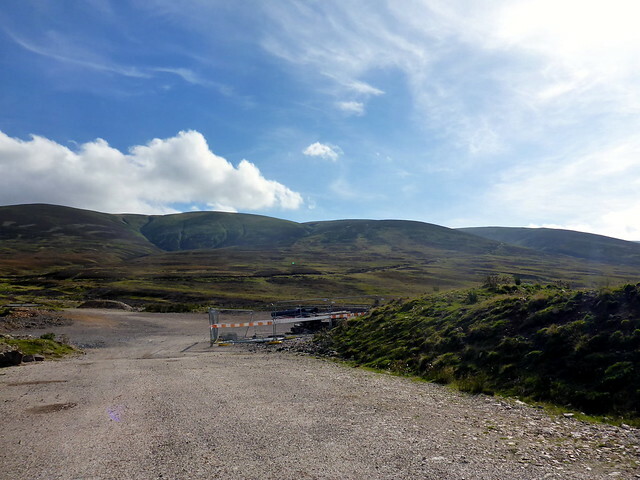 I'd originally planned out a route from Corrour that covered all the hills, but that was thwarted by a rail strike earlier in the year. Just as well, really, as it had the disrespectful conquest of Lancet's Edge from behind - without even sampling the blade. 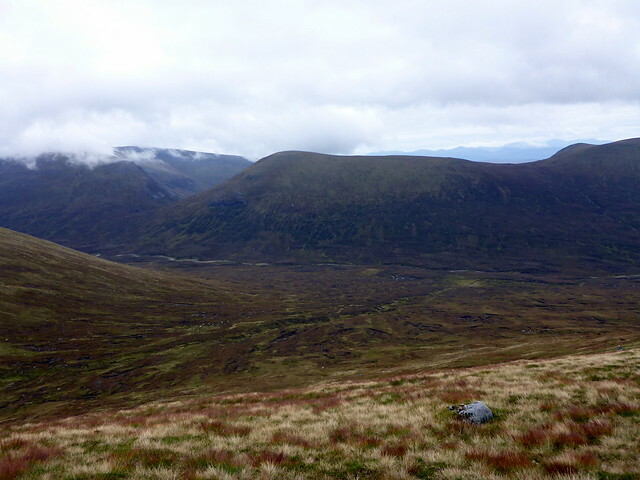 That just wouldn't do So my route for this weekend was a walk in from Dalwhinnie, camp somewhere near Culra then tackle the Lancet from front on. 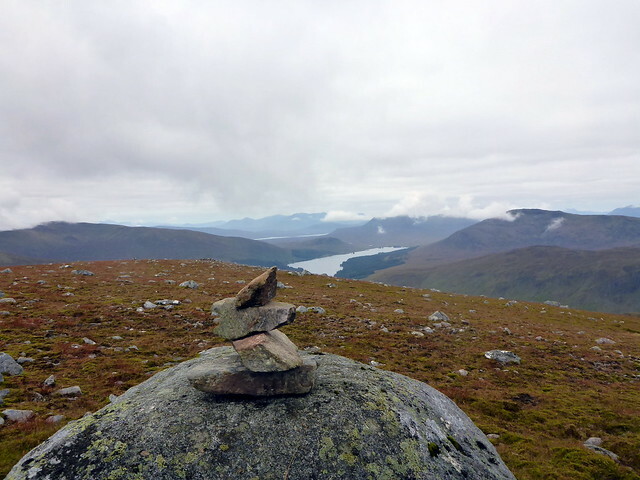 And add a few Munros for good measure of course. 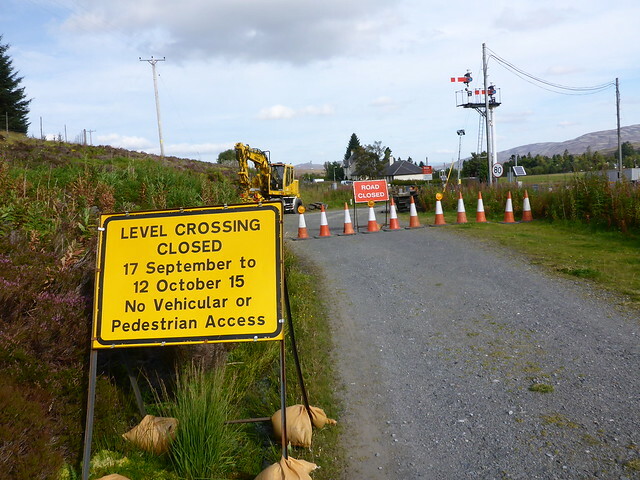 I arrived at Dalwhinnie at around 6pm to find the level crossing closed to pedestrians. With no suggested alternative route, I required to Astrally project myself over the rails and find myself again on the other side. 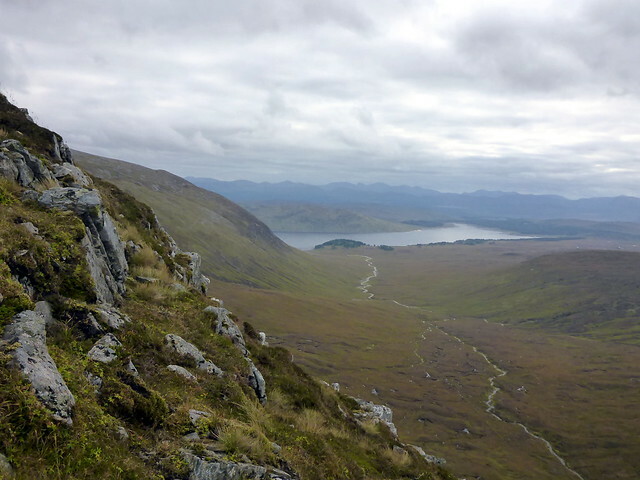 Then it was a matter of walking down the fine track that runs along Loch Ericht. Some people take cycles to do this bit, apparently. 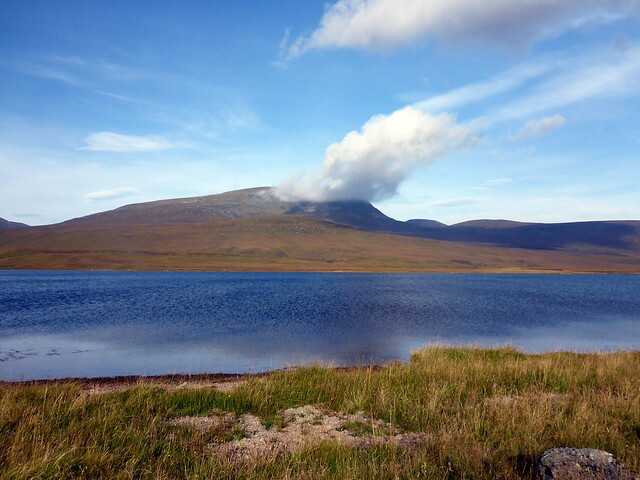 Dusk was falling as I walked past Ben Alder Lodge and turned north, heading for the shores of Loch Pattack. I had no fears of the dark - I'd brought my super-duper LED Lenser headtorch that is as bright as stadium floodlights. 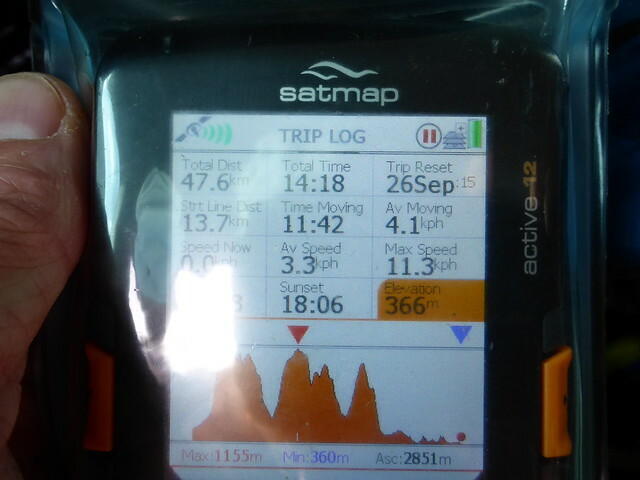 Except i hadn't checked if it was charged up - it wasn't and I had to rely on my trusty Petzl, which did the job. I saw a couple other headtorches down by the waterside, just by the bridge and said a brief hello to a group of youths camped there. 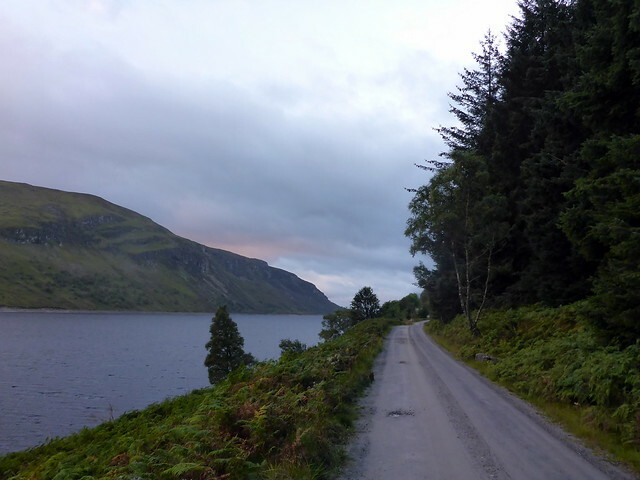 I might have been tempted to set up near the loch myself, but decided to stick with the original plan and head down towards Culra - less miles for Saturday. 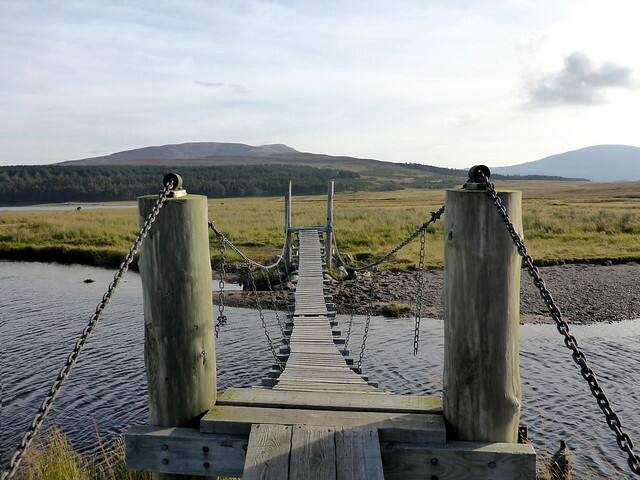 Crossing the footbridge just before the bothy, I found a nice flat spot by the Allt a'Chaoile Reidhe and pitched. 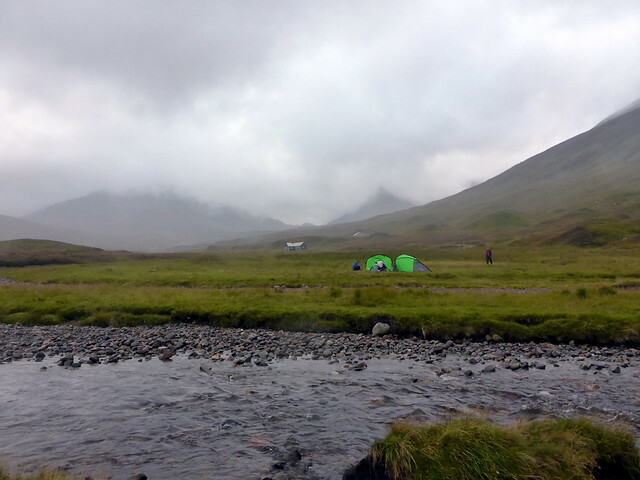 Sweet dreams to the plashing of the river - I do like camping beside running water. 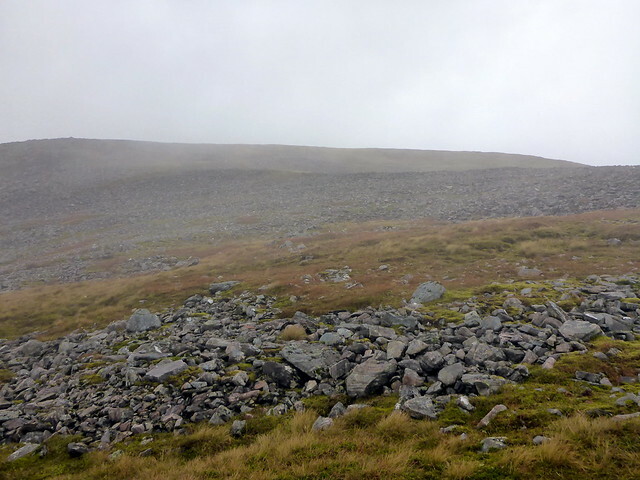 From here I walked through thick clag up scree-covered slopes to the summit of Geal Charn. 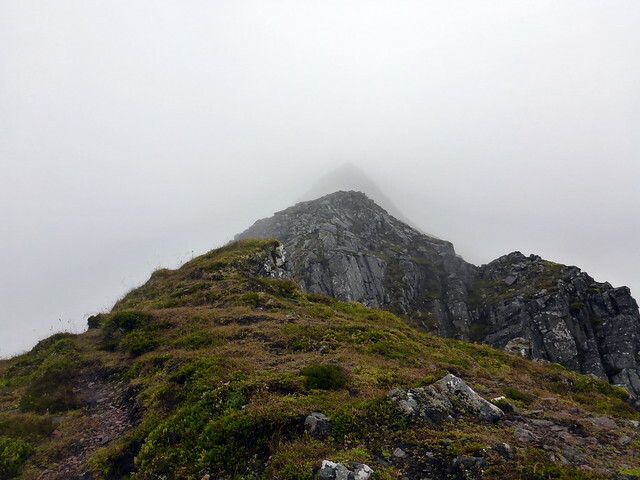 The clag was starting to clear and I could see the ridge stretching off to my left - Aonach Beag and Beinn Eibhinn. 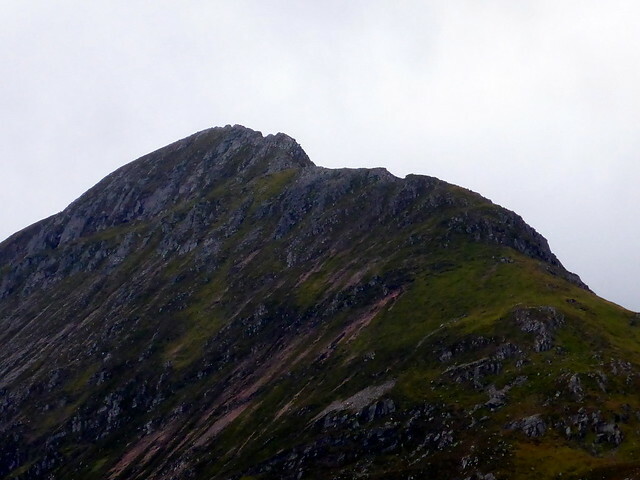 There's little in the way of drop between these summits and I trotted along the path, past the spot on the linking ridge between Aonach beag and Eibhinn where Allison almost came a cropper last time, tripping on her crampons. 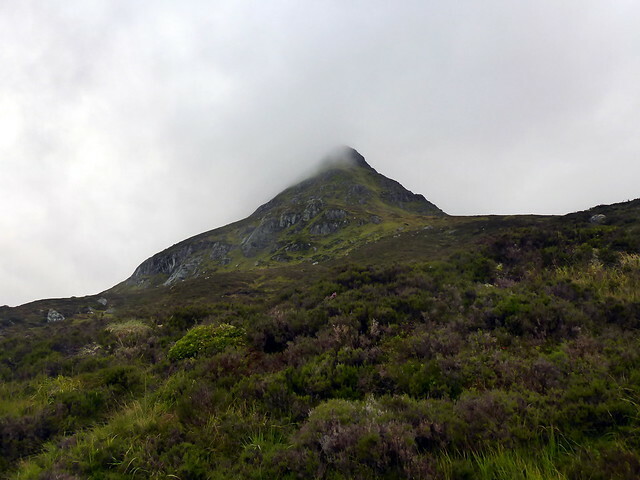 At the summit of Eibhinn were a group of lads who'd walked in from Laggan, and behind them 2 other groups of folk - a busy hill this. 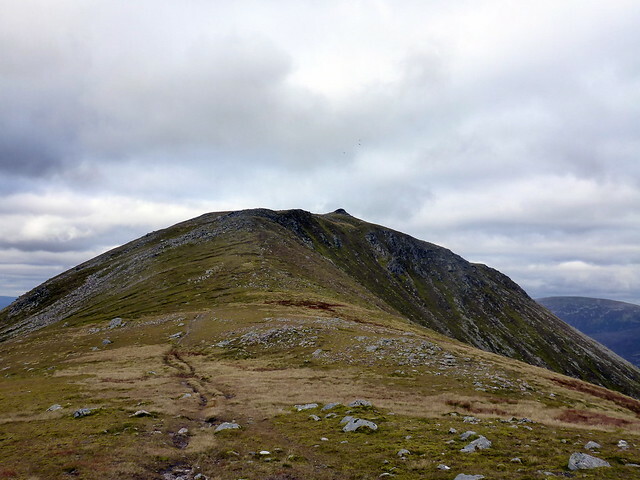 I descended though clag down to the south, round the rim of Glas Choire to my second target, the diminutive bump that is Meall Glas Choire. This brought my Tops required down to single figures. 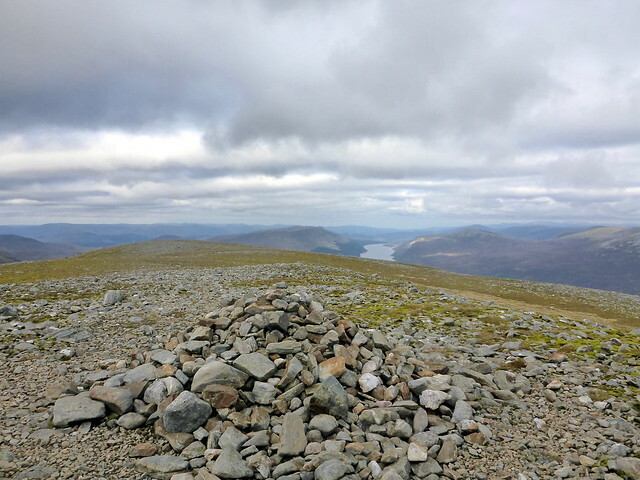 I sat and had lunch at the summit and speculated on my route down. 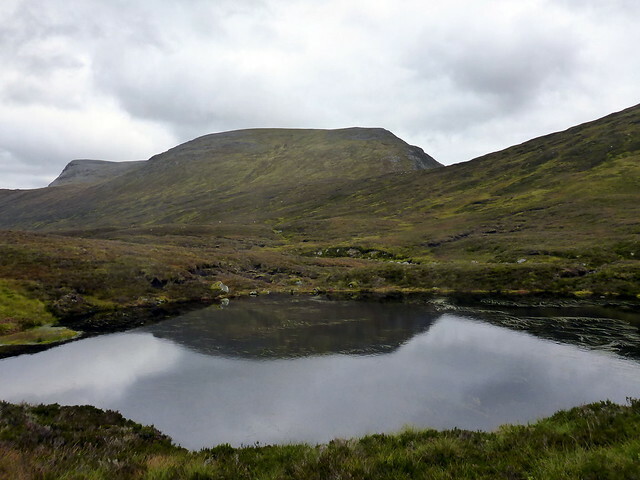 I was heading for the back of Ben Alder beside Bealach Cumhann, and instead of following the shoulder of Meall Glas Choire down, I cut across, down into the coire, staying higher than the boggy lower ground, then crossed over the track and gradually rose up to the start of the flat ridge up Ben Alder. 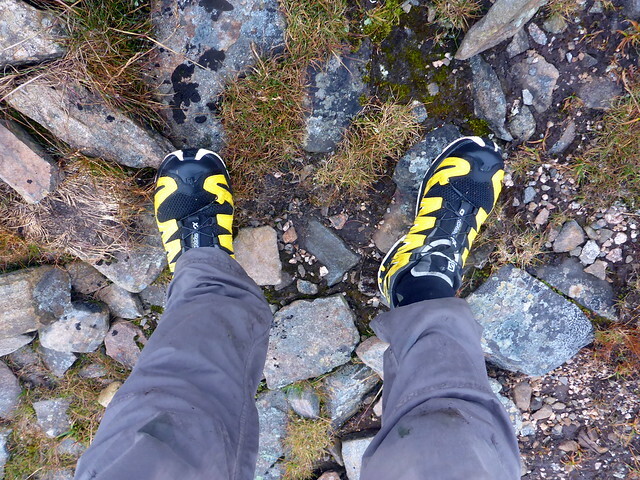 I had originally planned to return along Bealach Dubh and climb Alder by the Long Lethchois tomorrow, but it was far too early in the day to finish up, and - to be honest, I didn't fancy more scrambling in these shoes, so the flat back approach was chosen. 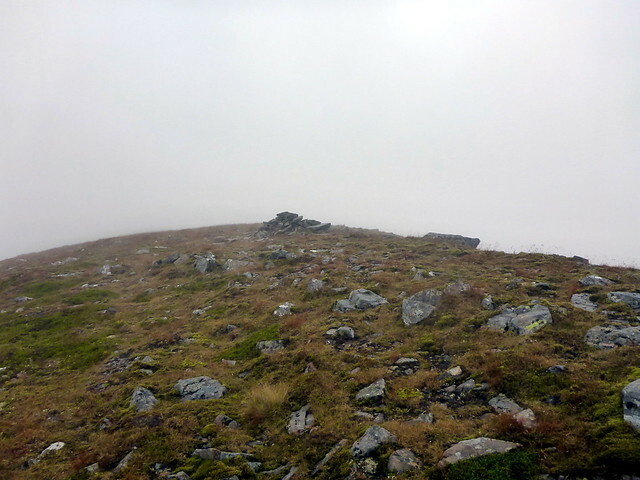 Grassy, mossy, wet slopes took me steadily up towards the summit of Alder. 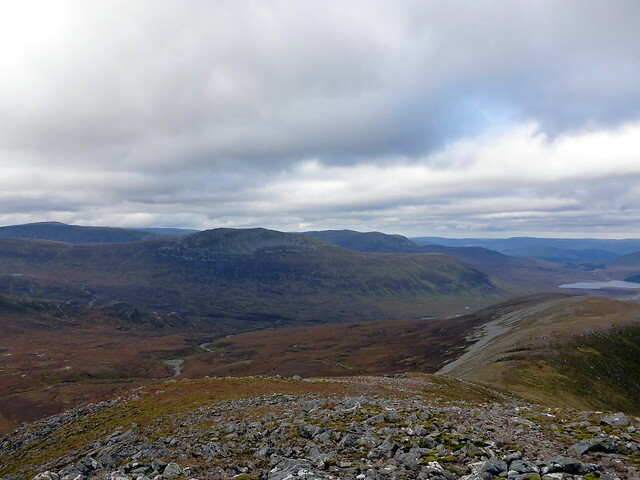 I paused to look down the length of the Allt Bealach Chuimhainn running to Loch Ericht, past Ben Alder Cottage which was hidden in trees. 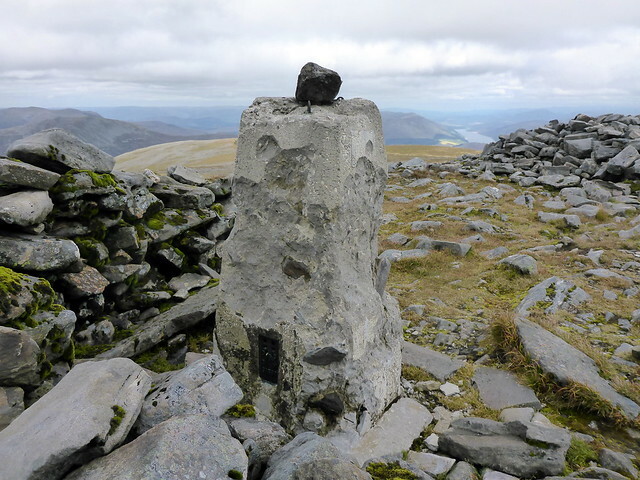 I reached the summit of Alder, with its mutilated trig point and sat for a few moment in the wee shelter nearby as the wind had got up and was sending chill fingers down my neck. 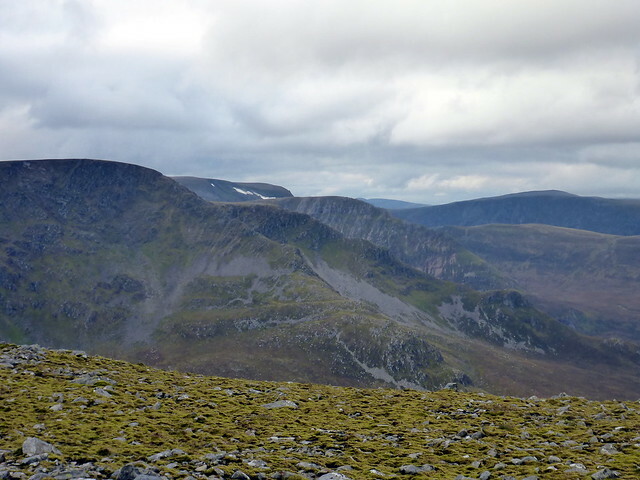 Turning south along the edge of Garbh Choire I met a couple of men that had walked in from Bridge of Gaur and were returning the same way. 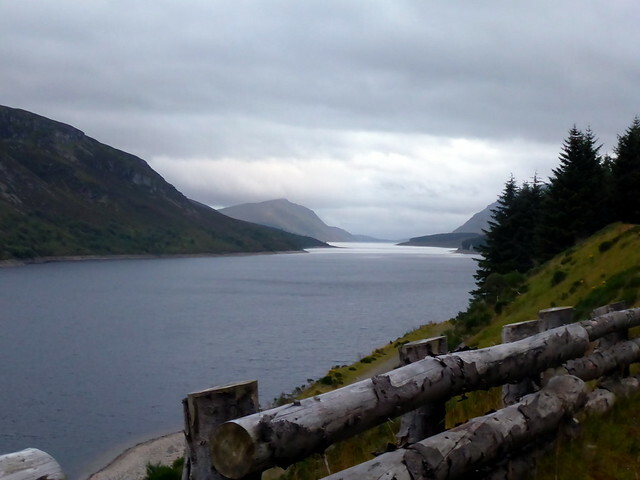 Long walk, that! 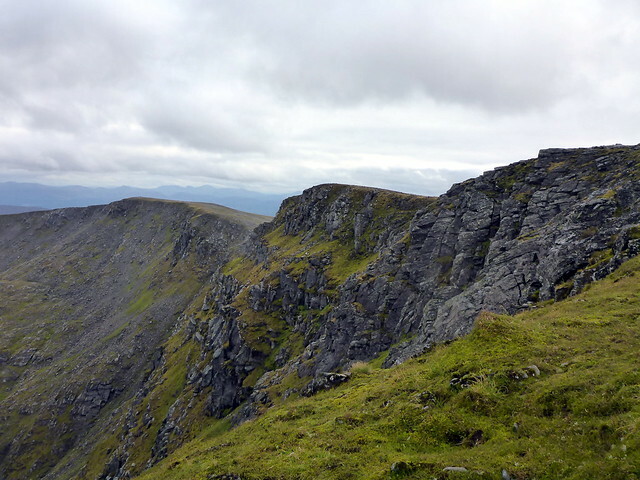 I dropped down the steep stony slopes to Bealach Breabag and immediately started up Beinn Bheoil. 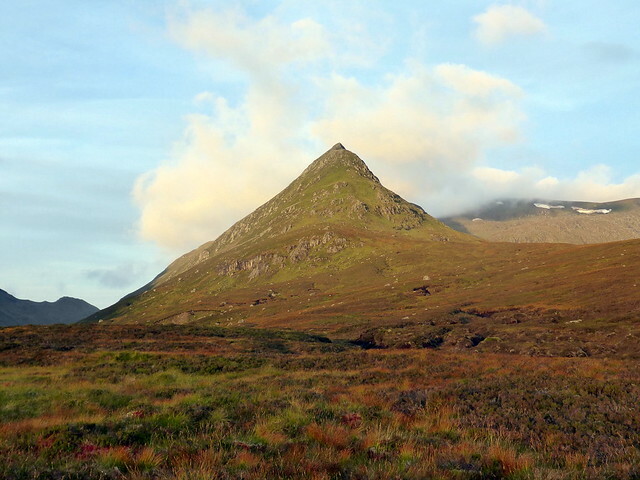 I have associated these hills with being snow clad in my mind, so it was unsettleing to see the rock and grassy slopes instead of icy white. 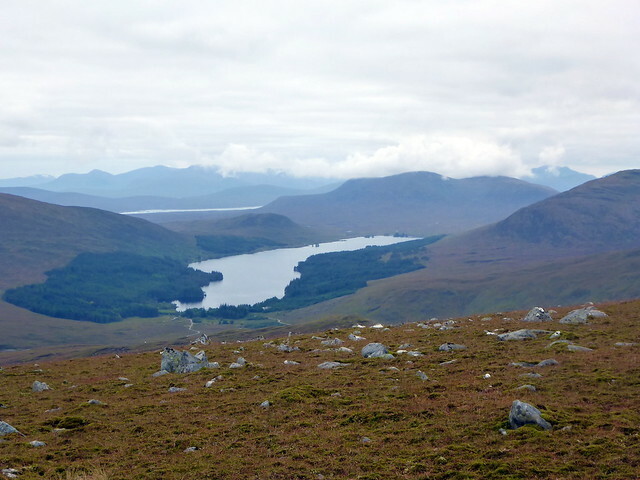 Makes walking them a bit easier Before long I had reached the summit of Bheoil and was looking along Loch Ericht as it stretched back towards Dalwhinnie. 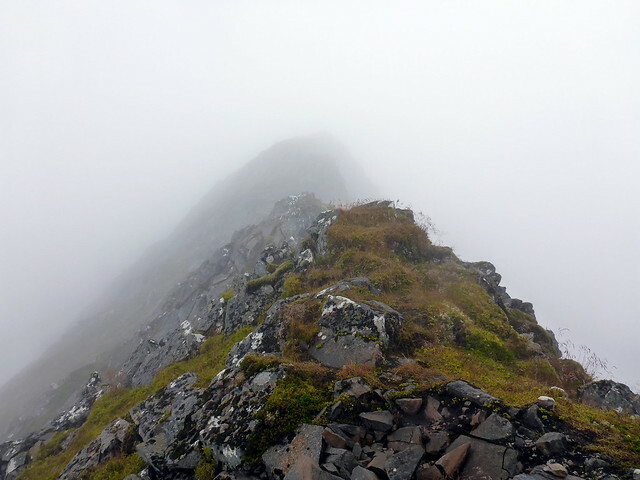 Onwards, down the stony back of Bheoil until I judged it easy enough to scramble down towards the Allt a'Bhealach Bheithe. 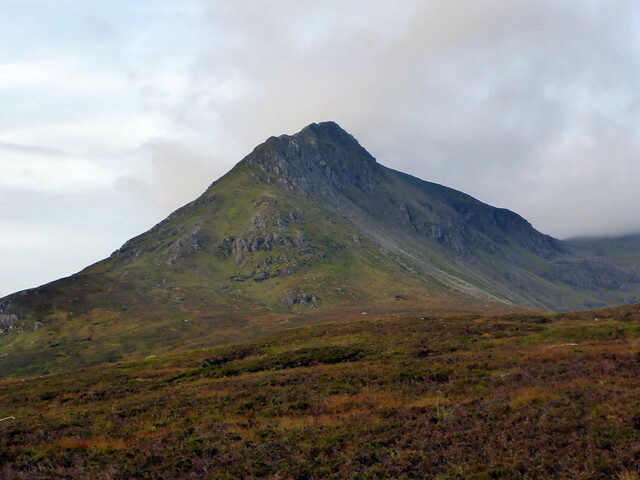 I wasn't sure where to pitch - it seemed a shame to leave Carn Dearg unclimbed on this outing, but if I went back to Culra I would have to lose extra height. 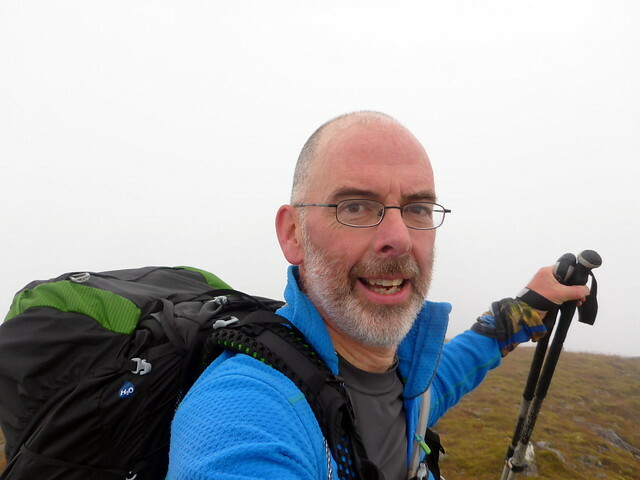 I remembered the ascent of Carn Dearg from Culra Lodge as being extremely steep and tiring, but I was carrying a mega-pack back in those days. 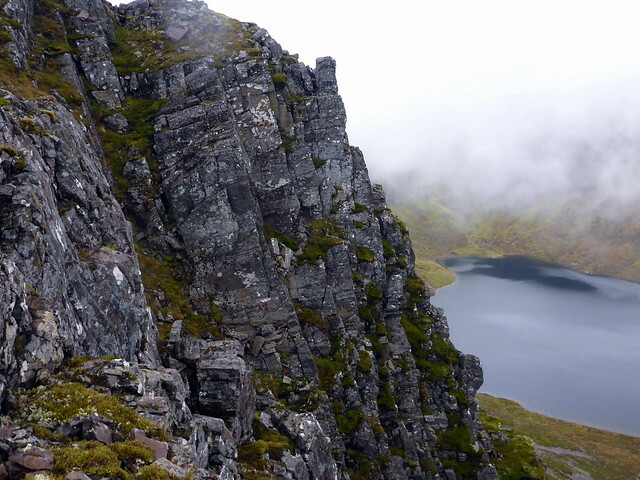 I reckoned I could either find a spot somewhere near the tail of the Long Lethchois or climb up to the flat bealach between Dearg and Geal Charn and pitch there. 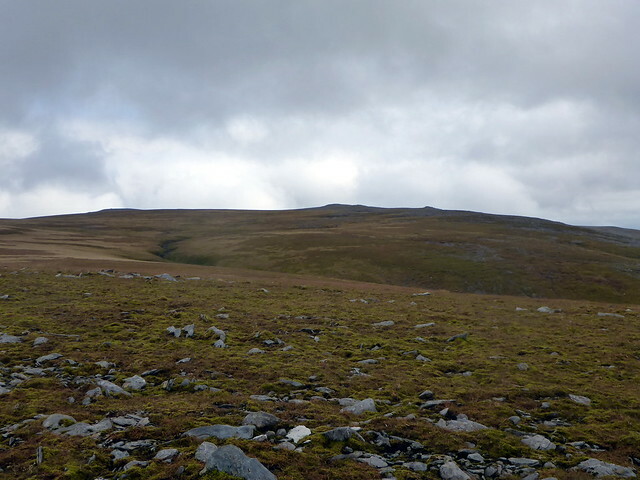 I sauntered down towards the river, filled my water bottles and found a dry, flat topped hummock. 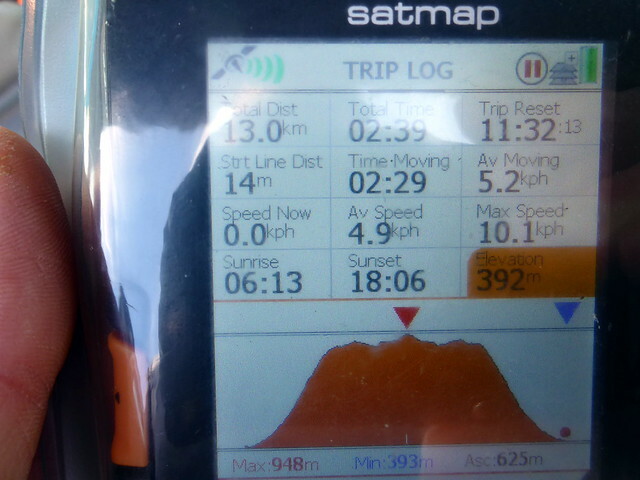 It was about 5.30 and I reckoned I'd done enough for the day. Pitch-time. To my left rose the Lethchois, to my righ Sgor Iutharn - not a bad vista. 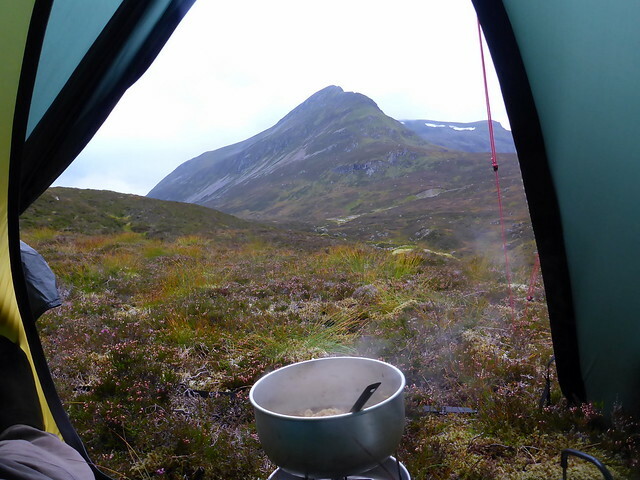 I sat and watched them as I cooked my noodles, then had an early night (in bed before 6.30 as the midges had started to congregate in the vestibule. 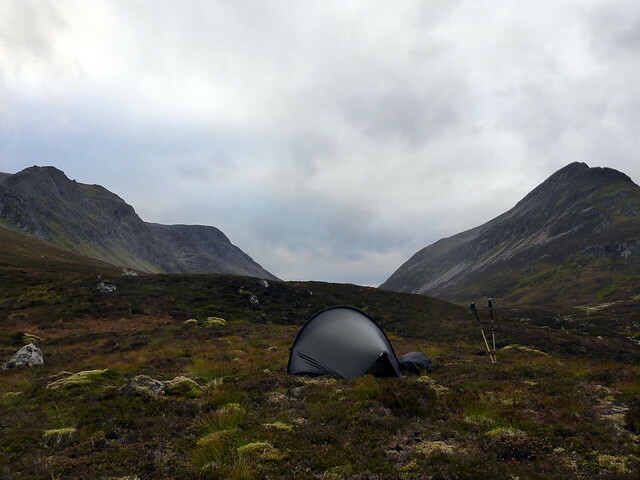 A restless night - the wind got up between 4 and 5am and buffeted the tent around somewhat. 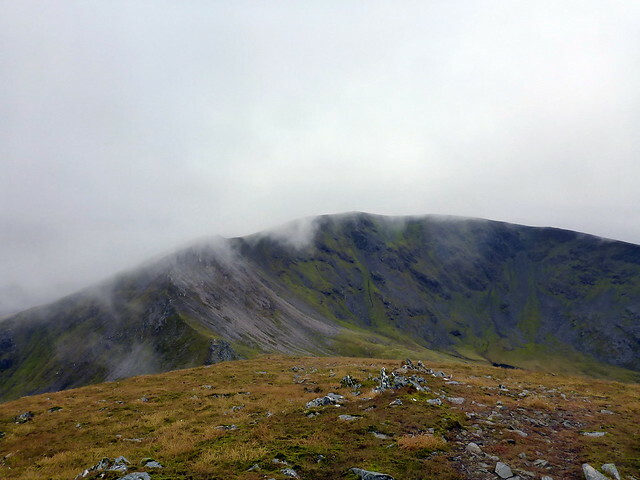 Stags roarer, sometimes off on distant hillsides, sometimes nearer at hand. 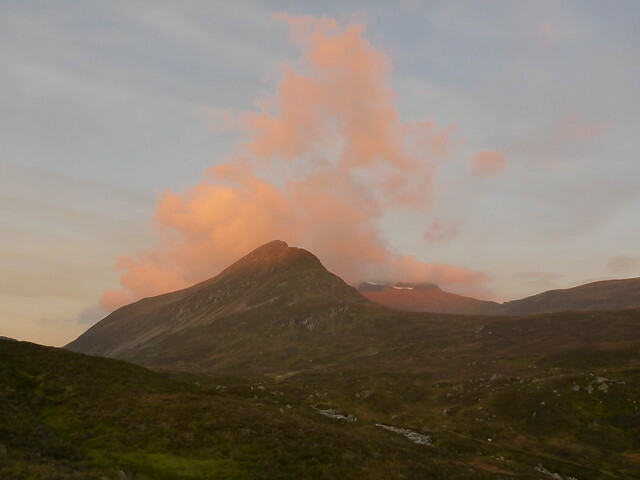 Morning brought a rose-tinged sky with fluffy clouds - looked like a good day in prospect. 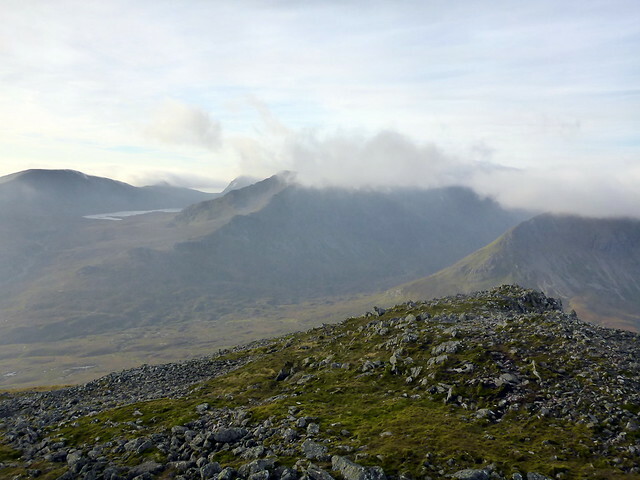 Struggling against the wind I packed up the tent and was off by 7am, crossing over yesterday's path and up onto the heather lined slopes of Dearg. 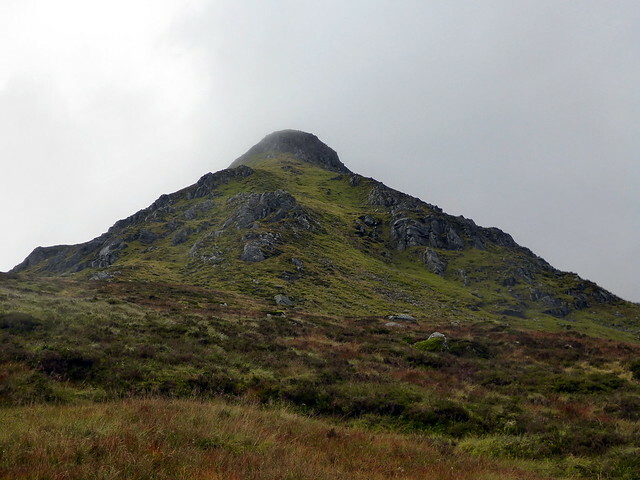 The Lancet looked fine from here - I almost thought of going up again in clear visbility. 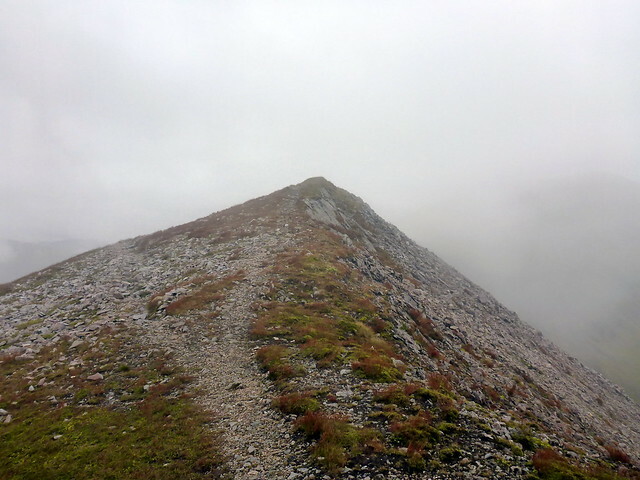 But instead I headed up, onto the stony top section of Carn Dearg. 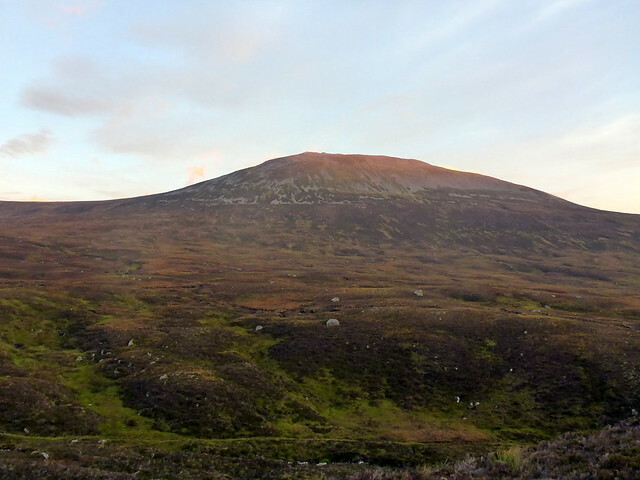 Met another early morning walker who'd come from Culra. 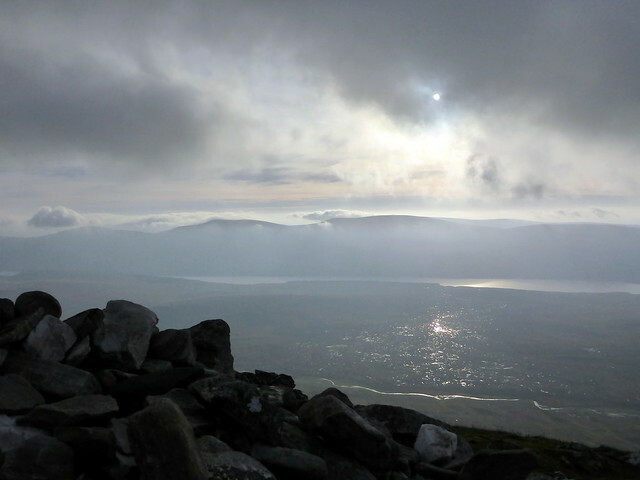 Up to the summit - the sun shining on 10 000 lochans over to the east. 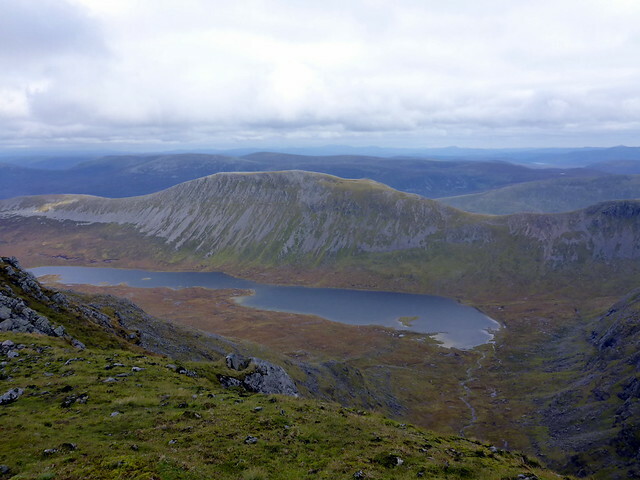 I had decided to walk the length of Carn Dearg, rejoining the track near to Loch Pattack. This proved straighforward and before long I was back on the track, trotting back the way I'd come on Friday night, past the stag ponies, across the wobbly bridge. 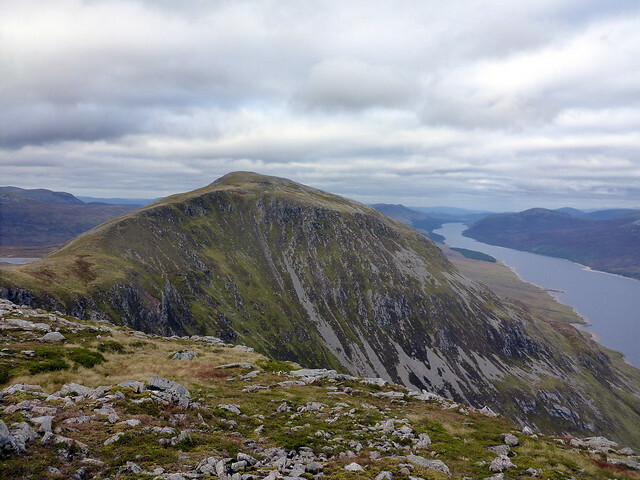 Made good time up the side of Loch Ericht, despite stopping for an early lunch in glorious sunshine and was back at the car by 12.30. 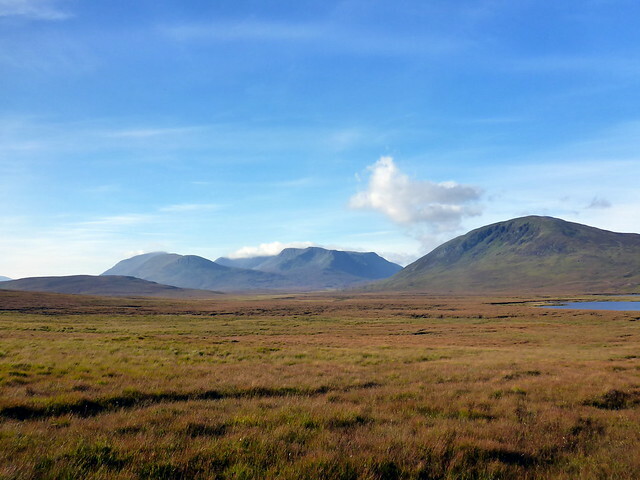 It was far too nice an afternoon to just pack up and drive home. 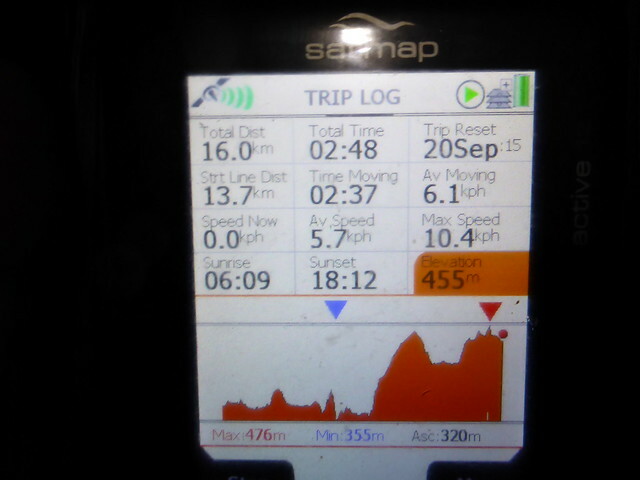 I swithered what to do - the Easians would be nice today, but that did involve a bit of a drive. 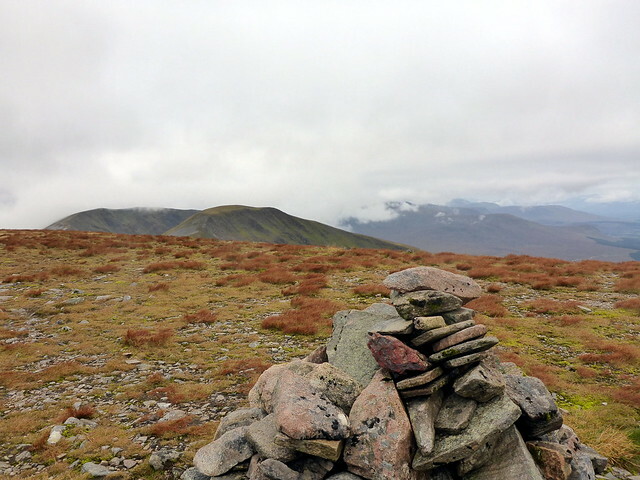 I had Carn na Caim just across the road - the only Munro in the Dalwhinnie area unclimbed on round two, so why not? 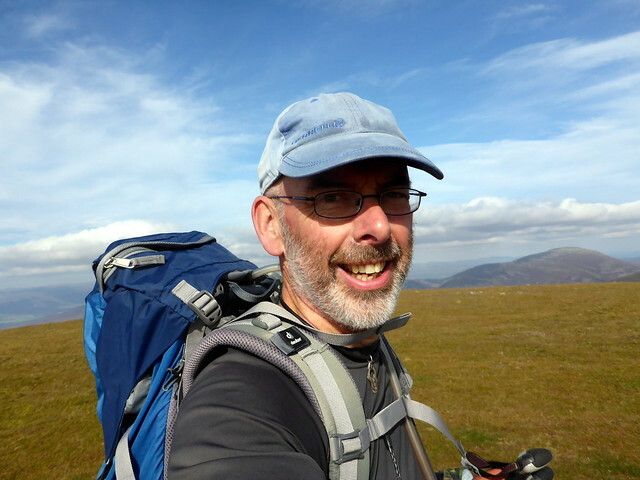 Parked up at Layby 88 and set of up the track, having switched rucksacks. 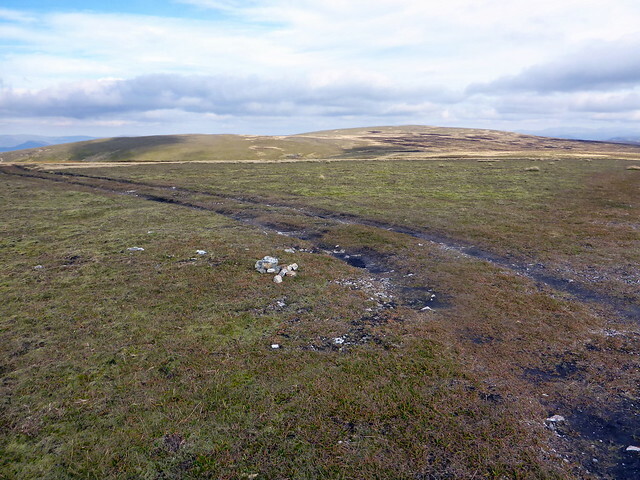 Nothing much to say about this hill - a steady ascent up the bulldozed track to 900m then off across rolling heathery hilltops towards the cairn. 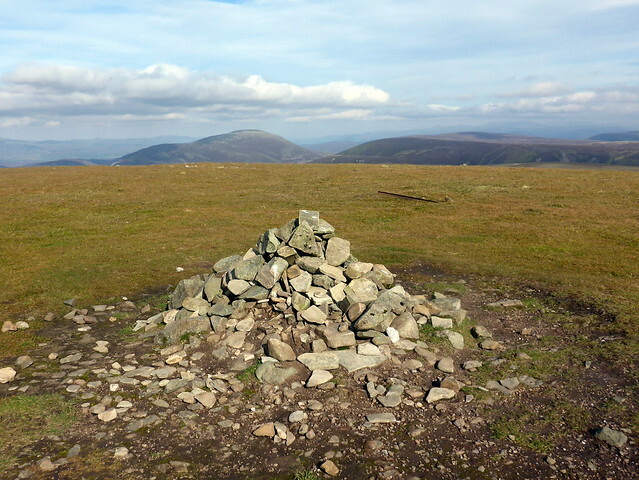 Last time I'd been up here was in a white-out and the cairn had been completely buried in snow, which made finding the highest point something of a lottery This time the views were good, towards Meall Chuaich in particular. 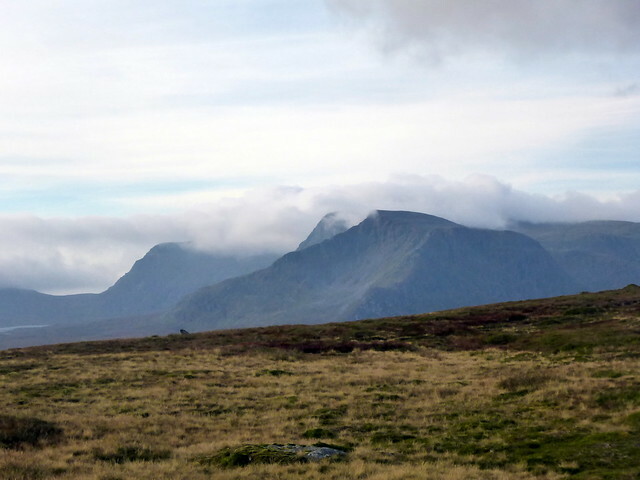 A cold wind had me reaching for my jacket and turning for home. No surprise that Sunday was the better day, since I was out on Saturda . 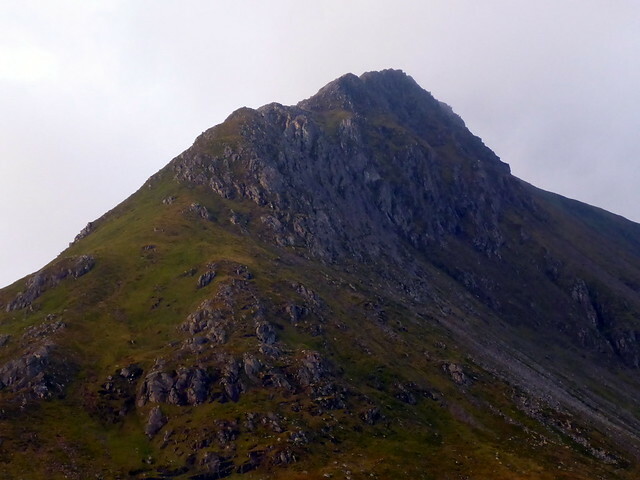 Sensible choice to go up the front of Lancet Edge - it's a great setting for a scramble and would be a shame to plod up the back just to visit the summit . 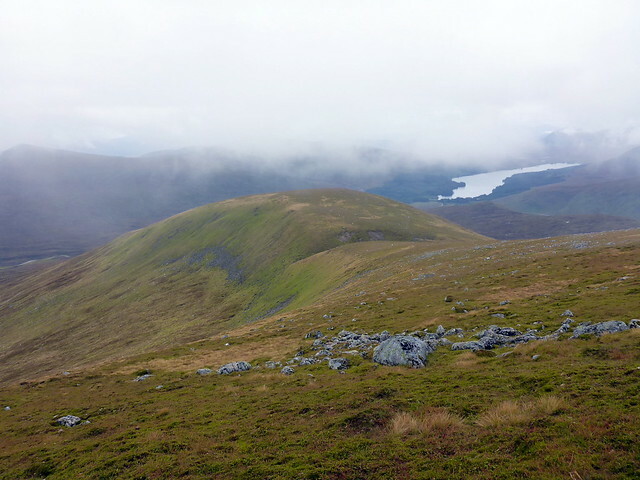 Your photos of clag floating down Loch Ossian reminded me that I was not too far away on Beinn Pharlagain. Another top report, another huge walk . Be great if Salomon made a better trail runner for the wet rock/scrambling. 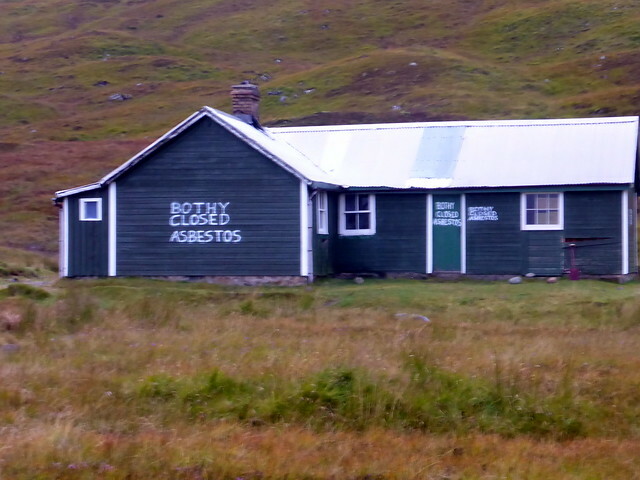 I've yet to do an overnighter in a bothy but have ventured in for a nosey, shame about this one.